UK-based Brigade Electronics, a leader in vehicle reversing safety products and systems, with offices in the U.S. and Canada, recently announced that it has created its own Safety First charter; in line with the US NationalTransportation Safety Board’s (NTSB) 2017-18advocacy priorities. "As a trusted partner to the waste and recycling, pipeline, highway transportation, mining and construction equipment industries, Brigade monitors all the necessary legislation and standards closely," says Henry Morgan, Director & CEO, Brigade Electronics Canada. "And we regard the NTSB’s (National Transportation Safety Board) annual Most Wanted List as an industry barometer -- one whose recommendations we take seriously, and are dedicated to helping our customers implement, right across the sectors they operate in." "One of our aims is to reduce fatigue-related accidents," continues Morgan. "When tired, a driver’s/operator’s cognitive responses slow and their judgment becomes impaired. It’s as serious as Driving Under the Influence (DUI) -- which is why we’re also committed to reducing risk from tiredness, ending alcohol and other drug impairment in transportation, and eliminating temptations of distractions." To do all of this, Brigade says they aim to expand recorder usage to enhance safety . By simply installing a Mobile Digital Recording device (MDR), this silent witness deters poor driving, eliminating the majority of avoidable accidents. When combined with efforts to increase the implementation of collision avoidance technologies -- such as Brigade's 360-degree view camera system, radar and ultrasonic detection systems -- drivers are readily aware of any surrounding objects or people in the immediate vicinity; to the front, side, or rear of a vehicle; which helps avoid accidents. Brigade's range of products include: Mobile Digital Recording (MDR); Ultrasonic Detection; Backeye 360 and Backup Alarms. Without a demonstrable commitment by an organization to safety all the other steps outlined below are meaningless. Fitting a product isn’t enough: a company’s culture of safety is key. Drivers and vehicle operators have a responsibility to let those nearby know when they’re indanger. Tonal alarms give a general warning of a machine backing somewhere in the neighborhood, but broadband sound alarms are directional -- letting people know when they’re in immediate danger. There are often at least ten areas a driver needs to view. It takes a second to focus on one, and a third of a second to switch views from one to another; valuable time lost constantly switching views. A detection system coupled to an installed camera dramatically increases safety. A 360-degree view camera system is the ultimate solution. what actually happened -- saving stress, admin, and litigation for companies. It’s the equivalent of having a supervisor in the cab. Brigade Electronics Inc. is a wholly owned subsidiary of Brigade Electronics plc, a market leader in backing safety systems. Established in 1976, Brigade says they are the only company in the world to provide a complete range of backing safety systems. The range includes BACKALARM reversing alarms, BACKEYE rear-view and all round visibility CCTV, BACKSENSE and BACKSCAN rear detection systems. Cenovus Energy Inc. has signed three-year deals with major rail companies to transport approximately 100,000 barrels per day (bbls/d) of heavy crude oil from northern Alberta to various destinations on the U.S. Gulf Coast. The agreements involve moving oil with CN from Cenovus's Bruderheim Energy Terminal starting in the fourth quarter of 2018, and with CP through USD Partners' terminal in Hardisty, Alberta starting in the second quarter of next year, both ramping up through 2019. Michelin Tweel Technologies, a division of Michelin North America, Inc., is introducing a new 26-inch airless radial tire with a four-bolt wheel-pattern hub designed for use on UTVs that will initially be sold as a fitment for the replacement market. Originally designed for military special operations use on light-tactical vehicles, the MICHELIN X TWEEL UTV 26x9N14 airless radial tire is a single unit that replaces the current pneumatic tire/wheel/valve assembly. Once bolted on, there is no air pressure to maintain, thus eliminating the need to carry spare tires, tools or repair kits. Keyera Corp. has announced the development of a crude oil storage and blending terminal in Cushing, Oklahoma. The Wildhorse Terminal ("Wildhorse") will include 12 above ground tanks with 4.5 million barrels of working storage capacity. The majority of the capacity is backed by fee-for-service, take-or-pay storage arrangements ranging from two to six years in length. SMS Equipment Inc. and KMC Mining have partnered to make big statements in support of prostate cancer research, breast cancer research and mental health awareness - unusual, bright, giant, and mobile statements, in fact, that are intended to spark candid conversations. PRINOTH is participating in the Canadian Utility Fleet Council (CUFC). Held annually, CUFC is the meeting place for all things electric utility in Canada. Volvo Trucks has boosted its heavy haul options for truck buyers with the release of the new VNX at a media event held at its Dublin, VA customer centre. The new addition features several models designed for everything from short hauls to those heading across country. TransRail Innovation Group's (TRIG) XLOAD sensor has been certified by the Association of American Railroads (AAR) to begin pilot trials on rail tank cars shipping hazardous commodities like crude oil and refined fuels. A new study on industrial accident prevention has shown that broadband sound reversing alarms for commerical vehicles, are nearly twice as effective than their tonal equivalents; making broadband sound the most effective audible reversing safety solution for a variety of industries. Oil sands producer Suncor has announced it will proceed with the phased implementation of autonomous haulage systems (AHS) at company-operated mines, starting with the North Steepbank mine. Over the next six years, the company expects to deploy more than 150 autonomous haul trucks in the full program, which will be one of the largest investments in electric autonomous vehicles in the world. The British Columbia government is proposing a second phase of regulations to improve preparedness, response and recovery from potential spills. DTN has released its newest enhancements to its Terminal Inventory Management System, DTN TIMS. The latest version further improves operational forecasting by introducing pipeline schedule data to increase insights, enable data-driven decision making and provide greater control of fuel inventory. Bridgestone Americas, Inc. offers two free jobsite resources for customers in the mining, construction and aggregates industries. The pre-shift inspection poster and video provide general guidelines to identify and report irregular tire, rim and wheel conditions early, lowering the lifecycle cost of OTR tires. When loads exceeding a quarter of a million pounds need to be moved, few haulers in the United States possess the kind of equipment operated by Edwards Moving and Rigging. PRINOTH, one of the world's leading manufacturer of tracked vehicles, continues to grow its dealer network across North America and as such is announcing a new dealer for the State of Ohio. As such, Company Wrench will now represent PRINOTH for the PANTHER vehicles line-up. ARDCO introduces a new AMT Pipe Trailer attachment for the Articulating Multi-Purpose Truck (AMT). Designed for safe and efficient handling of pipe, the AMT Pipe Trailer offers adjustable lengths and exceptional load capacity, making it ideal for off-road transport in pipeline or utility construction applications. Irving Oil has announced the grand opening of its St. John's Marine Terminal Expansion - a $20-million investment that will improve harbour logistics and help position St. John's Harbour for future growth. The expansion adds a new fuelling berth on Pier 23, adjacent to the company's existing facilities on Pier 24, doubling the number of vessels that can access marine gas oil (MGO) via pipeline at its Marine Terminal. Blackmer S Series Twin Screw pumps provide numerous design and efficiency advantages that are ideal for transfering bitumen from tankers to the distant tank-farm facility. Liquid bitumen must be handled at very high temperatures in order to keep it at a workable viscosity. However, even at high temperatures liquid bitumen can be an extremely viscous and shear-sensitive product. Therefore, shipyard operators and tanker owners demand a pumping technology that has been specifically designed to transfer highly viscous liquids over great distances. OPW Engineered Systems, part of OPW's Fluid segment within Dover Corporation, will showcase its new “Total Terminal Solutions” at this year's International Liquid Terminals Association (ILTA) Trade Show, June 12-14 in Houston, TX. Westport Fuel Systems Inc. has commended the publication of a new study by West Virginia University scientists at the Center for Alternative Fuels, Engines and Emissions ("CAFEE") quantifying methane emissions from heavy-duty natural gas-powered vehicles and refueling stations. CAFEE scientists collaborated on the study with the Environmental Defense Fund ("EDF") and a group of global natural gas industry leaders including the American Gas Association, Chart Industries, Clean Energy, Cummins, Cummins Westport, International Council on Clean Transportation, PepsiCo, Shell, Volvo Group, Waste Management, and Westport Fuel Systems. The study was published online by the journal Environmental Science & Technology and the results greatly expand on the very limited data on methane emissions from natural gas vehicles. Wellmann Group supplies on-site transport & weighing services to the whole Guinean Gulf region. On the Lagos based NIGERDOCK fabrication yard, Wellmann recently performed the transportation of the heaviest Oil & Gas structure ever manufactured in Nigeria. The 50 x 60m sized topside weighed 3,340 tons and was handled on four groups of synchronized Nicolas MHD SP modular trailers totaling 128 axle lines. A new line of offroad trucks introduced by Western Star are designed for rugged, tough applications in various industries from mining to construction – and one version is designed for multiple uses. Trimble has announced the availability of Trimble LOADRITE H2250 Haul Truck Monitor for rigid body haul trucks in the aggregates extraction and process industry. The H2250 is an in-cab display and sensor system with an InsightHQ cloud reporting option for reporting. The 2016 federal budget, announced March 22, outlines an ambitious agenda aimed at transforming Canada's economy. Focused on delivering key commitments from the fall election, the Canadian Natural Gas Vehicle Alliance (CNGVA) is pleased to see there are a number of opportunities for Canada's natural gas vehicle sector. The Canadian Gas Association (CGA) is very pleased that the federal budget's "Growing the Middle Class" strategy includes a number of initiatives that recognize the role that natural gas and the natural gas delivery industry can play in fostering economic growth, driving Canada's environmental performance, and helping the middle class. Donner Industrial Developments Inc. strengthened and diversified its products and services after finalizing its purchase of Edwards by Brehmer Mfg., a truck maintenance equipment line that built a strong reputation during its 15 years of experience. The new product line features several high-quality pieces of equipment, including waste oil caddies, antifreeze caddies and truck ramps, for applications in truck service centers, agriculture, municipalities and fleets, to name a few. Caterpillar Inc. has announced it will discontinue production of its on-highway vocational trucks. Based on the current business climate in the truck industry and a thorough evaluation of the business, the company decided it would withdraw from this market. This is also in line with the company’s ongoing restructuring to align its businesses with existing conditions. As a result of this action, the company will cease taking new orders for vocational trucks, although Caterpillar remains committed to existing truck customers and will support the existing trucks currently on the road. 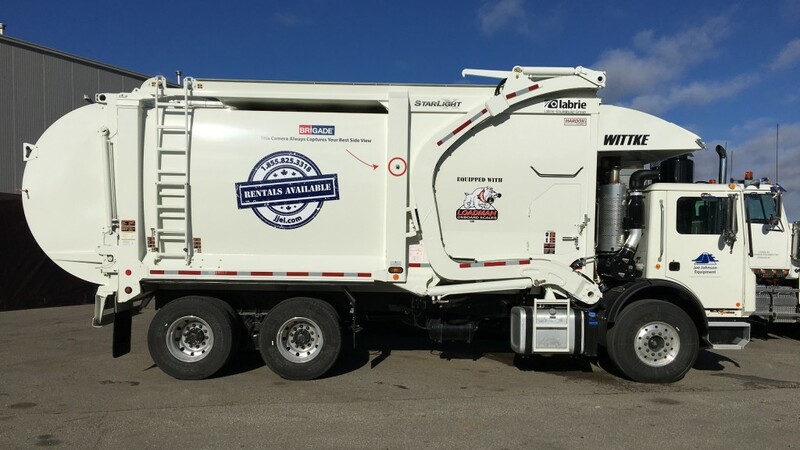 Mountain Tarp, a Wastequip brand, and manufacturer of quality tarping solutions for the construction, agriculture, transportation, waste, and recycling industries, has announced the debut of a mobile service program to handle on-site inspection of truck and trailer tarping systems, as well as turn-key parts delivery. Truck Evolution is a leader in sales and distribution of truck-mounted equipment in Alberta. Founded in 2011, the company sells some of the most technologically-advanced truck-mounted equipment available in North America and stocks a complete line of replacement parts to get customers back on the road as soon as possible. For the expansion of the infrastructure for the Cygnus gas field in the North Sea, ALE UK has once again been relying on SCHEUERLE SPMTs. On 168 SPMT axle lines and using a loose coupling mode, a 4,140 t segment of a production platform as well as a total of four support elements with unit weights of between 1,180 and 2,125 t were transported. Iowa Mold Tooling Co., Inc. (IMT) now offers a new Dominator III mechanics body. The new body design accommodates the IMT model 12000 telescopic crane without a front stabilizer for customers that do not require 100 percent lift capacity in all load zones. Situated offshore Sabah, Malaysia in a water depth of 1,854 feet (565 meters), is the Malikai oilfield. Operated by Shell, it is currently being equipped with all necessary infrastructures for exploration. Amongst this infrastructure is also a living quarters module. The module weighs a total of 1,293 tons and was recently transported on sixty axle lines of SCHEUERLE SPMT. Volvo Trucks North America continues to accept registration for teams of aftermarket professionals from Volvo dealerships throughout the U.S., Canada and Mexico to compete in the 2015-2016 Volvo International Service Training Award (VISTA) competition. VISTA, which involves teams from 93 countries, assesses teamwork, skills and knowledge in key areas that drive customer satisfaction. News articles earlier this year about driverless trucks operating in Nevada and the Alberta oil sands under restricted conditions set off speculation about whether we’ll need truck drivers within a few decades – and whether autonomous vehicles are an answer to the driver shortage. The Freightliner 122SD can now be spec’d with Allison 4700 Rugged Duty Series (RDS) and Oil Field Series (OFS) automatic transmissions. The combination of the 122SD with Allison’s vocational transmissions is ideal for tough off-road and oil field applications. Volvo Trucks has introduced a rugged version of the Volvo I-Shift automated manual transmission for severe-duty applications. The reinforced I-Shift for severe-duty (SD) applications is now available for order in Volvo VHD vocational models. The I-Shift for severe duty is designed for on- and off-road work in applications requiring frequent shifting. In a spectacular evening ceremony at Hoover Dam, Daimler Trucks North America (DTNA) unveiled the Freightliner Inspiration Truck to several hundred international news media, trucking industry analysts and officials. According to a 2009 report by management consultants Alvarez & Marsal, of all activities that encompass the life of an oil rig, mobilization accounted for about 25 percent – not much less than the majority of activity expected from casing and drilling, which represents 45 percent.